The Center for Land Use Interpretation explores how land in the United States is apportioned, utilized, and perceived. Through exhibitions and public programs, the Center interprets built landscapes—from landfills and urban waterfalls to artificial lakes—as cultural artifacts that help define contemporary American life and culture. 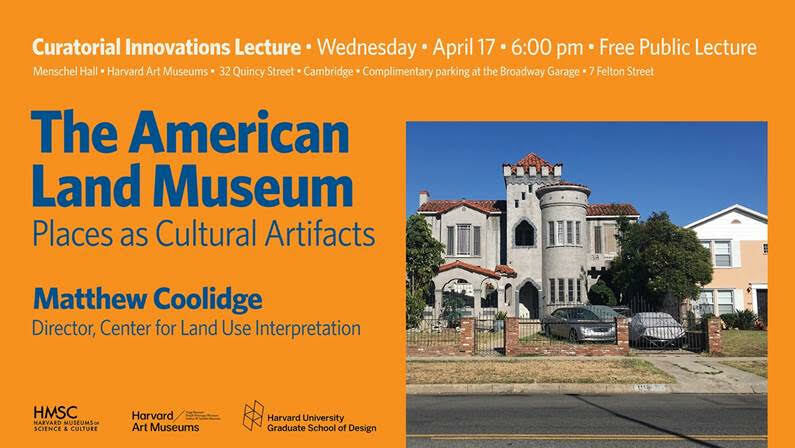 Coolidge will discuss the Center’s approach to finding meaning in the intentional and incidental forms we create and also talk about the Center’s efforts to develop the American Land Museum, a curated selection of locations across the country that exemplifies our relationship with the American landscape. Matthew Coolidge is Founder and Director of the Center for Land Use Interpretation (CLUI) in Los Angeles, a non-profit research and education organization founded in 1994 that is interested in understanding the nature and extent of human interaction with the earth’s surface, and in finding new meanings in the intentional and incidental forms that we individually and collectively create. He has a background in contemporary art, architecture, and film, and studied environmental science as an undergraduate at Boston University. He has been a teacher in the Curatorial Practice Program at the California College of Art, and has lectured and worked with students at universities around the U.S. and abroad.